One of A Tygenco Breiling’s great, early renditions of Dill. Dilbert Pinkerton was killed off in his first appearance. True story. That was the plan, anyway. He was created purely as a throwaway, nothing character. He was cannon fodder and nothing else. Until Gilbert Stack saved Dill’s life. Before Dill, I’d written two novellas. My intention was to create my own superhero universe in the same vein as Marvel or DC Comics. Its working name was egoistically called the NPU – the Nick Piers Universe. I later renamed it the Spectacular Stories Universe (still a working title). My two SSU novellas were available digitally on Metahuman Press when they still published serialized superhero fiction. The Farmer: XSF Getaway and The Altruist: The Weapon of Masked Destruction are no longer canonical, though. I’d like to re-write them someday. The broadest events still occur, like the destruction of St. Ligeia, but characters and smaller events will be greatly changed. The Altruist novella introduces The Armadillo. In it, a madman lays waste to the SSU’s superhero team, The Shatterpack. I wanted to fill the team with expendable heroes that weren’t interesting enough to keep alive for future stories. While creating characters to fill the roster, I thought it’d be fun to create a character to be part of The Trenchcoat Brigade (a TV Tropes nickname for trench coat-wearing characters). 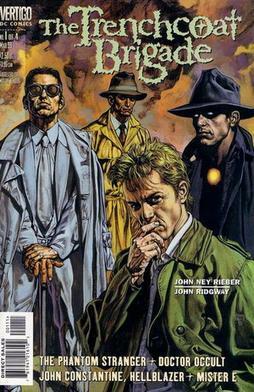 Basically, I wanted my very own character like DC’s The Question (the Justice League Unlimited version) or Rorschach from Alan Moore and Dave Gibson’s Watchmen: a surly, violent, nutcase detective. Tell me you can’t see this guy wearing a trenchcoat and fedora! Thus, The Armadillo was born! He wasn’t Dilbert Pinkerton, though. Not yet. 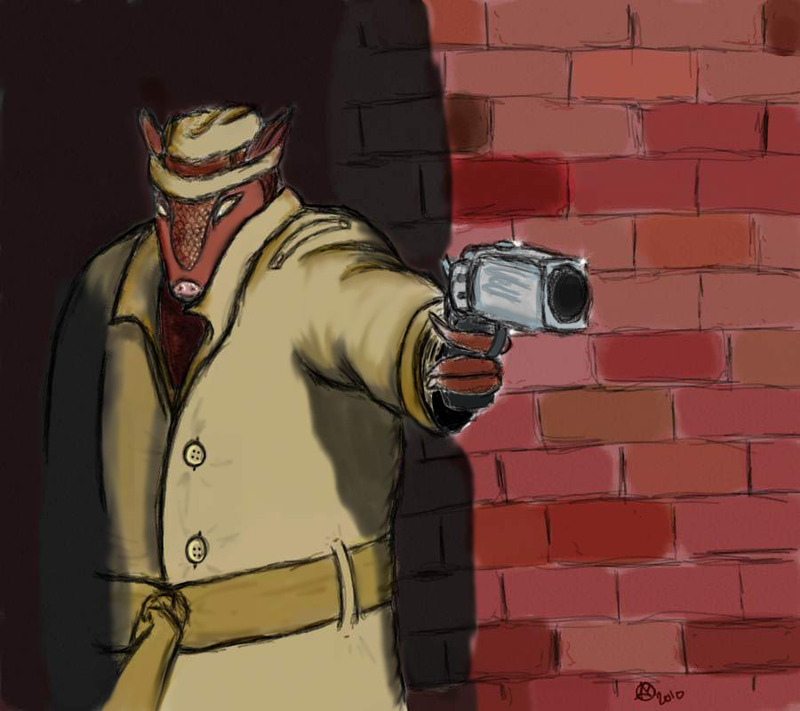 When I started writing scenes involving The Armadillo, I immediately had Rorschach’s voice in mind, though I was also inspired by James Cagney and Humphrey Bogart. He said “hurm” a lot, in honour of Rorschach. And like a classic 1940s detective, he smoked more than a Mad Men character. He was only in maybe three chapters, with one particularly fun interrogating scene with The Altruist, the titular hero of the story. The villain electrocuted The Armadillo. It was a pretty cool death scene, with a line about The Armadillo dying on his feet, like a true hero. The Altruist went on to beat the bad guy. The story ended with only a few surviving Shatterpack members. Then, something strange happened. After The Altruist novella had been up on Metahuman Press for some time, I started talking with fellow writer Gilbert Stack, whose work has been published in Alfred Hitchcock’s Mystery Magazine and other places. He quickly became one my biggest fans, giving praise I didn’t feel I deserved (and to a point, still don’t). We bounced ideas around about The Altruist, including changes I was considering. I mentioned killing off The Armadillo, regretting it because I had such fun writing him. Gil agreed it was such a shame I’d offed one of the story’s most interesting characters. He suggested, “Could you put him in a coma or something? These things happen all the time in superhero stories.” So, like Montgomery Burns being upgraded from dead to alive in The Simpsons, the electrocuted Armadillo make a gurgling sound, indicating that he lived. But he was in a coma. Not the best resurrection, but it served its purpose. Shortly after that, I started writing The Altruist sequel. Of course, the first thing I did? Add more Armadillo! I didn’t have a clue what to do with him yet, but he was alive and kicking, dammit. While all this was going on, I was introduced to a new fantasy series by Simon R. Green: the Nightside series. 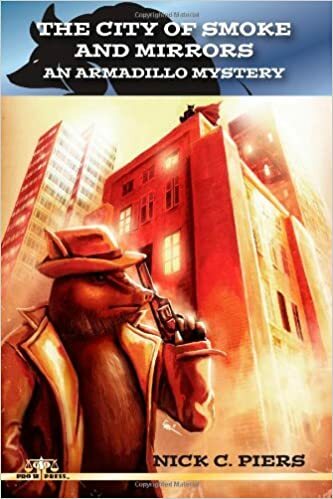 It was unabashedly fantasy detective fiction with non-stop action harkening back to the pulps of old. 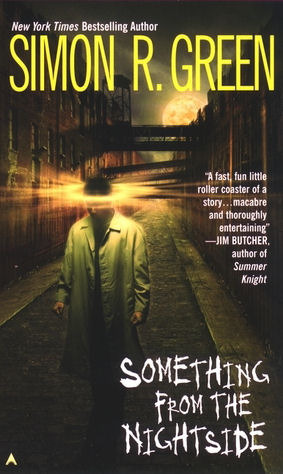 Shortly thereafter, I also started reading a sci-fi detective series by John Zakour, starting with The Plutonium Blonde. I thought, “Geez, I’d love to write a fun series of self-contained adventures like these! If only I had a character for the starring role. But I don’t really have any kind of detective char–” Waaaait a minute. I did! I did have a standing member of The Trenchcoat Brigade just begging for his own adventures! The Armadillo! I brainstormed what kind of novel starred this mutant pest. He’d live just like an armadillo: in some hole in the ground. He’d live out of a basement office called The Hovel Office, living in filthy conditions because he liked it that way. Some joking with friends on Facebook inspired the plot for THE CITY OF SMOKE & MIRRORS. I’ll get to that at a later date. On a whim, I sat down and wrote the first two chapters without putting too much thought into them. It was like slightly focused free-writing. I wanted to test the waters and see if writing a story about this ridiculous character could actually work. And by god, the character wrote himself. I’d heard other writers talk about a character taking over or surprising them, but I had no idea until then. The Armadillo was just so easy to write. Tony Castillo, ladies and gentlemen! I borrowed Tony Castillo from a short story I’d written for A Thousand Faces (Vol. 9, July 2010) and made him The Armadillo’s friend. He’d also made a small appearance at the end of The Farmer. Tony’s actually an older character who I used as a referee in my tabletop wrestling role-playing days. He’s inspired by a ref I saw at a Grand Prix Wrestling show once who had a really greasy mullet. My friend Mitchell and I used to call him the Greased Zebra. Tony then made an appearance in my very short-lived e-mail wrestling federation, Independent Spirit Wrestling. The setting for the show was in this greasy bar called Castillo’s. Putting Dill in Castillo’s seemed appropriate. I had no plans for them to become such close buddies. Oh, and he’s also based off Elias Koteas’ role as Casey Jones in the 1990 Ninja Turtles movie. That’s how I picture him ever time I write him. In those early writings, Tony called him “Dill” for short, which felt natural for two old friends. By the time I reached Chapter 6, I toyed with the idea of giving The Armadillo an actual name. It felt off for his jail keeper to shout, “Dillo! Armadillo!” Why couldn’t The Armadillo have a full name of his own? Something he wrote on his tax forms. You know, if he did his taxes. 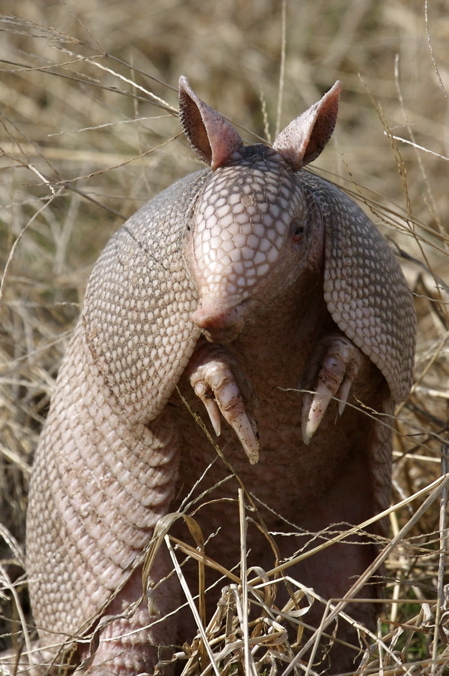 At first, I thought I’d call him “Dillo Arma,” so when he wrote his last and first name on a form, it would show up, “Armadillo.” The more I thought about it, “Dill” was just a shortened version of “Dilbert.” Okay, I had a first name. But “Arma” didn’t roll off the tongue. During my undergraduate at York University, I took a class called Film & Literature. We compared certain novels with their film adaptations, such as The Wizard of Oz, V for Vendetta, and 300. One was Dashiell Hammett’s Red Harvest (loosely adapted into Akira Kurosawa’s Yojimbo). The lecture on Red Harvest included historical context, such as information on the Pinkerton Detective Agency, who employed Hammett before he became a writer. Huh. Pinkerton. Dilbert…Pinkerton? I said the name several times to myself. Dilbert Pinkerton. Dilbert Pinkerton! Dilbert frigging Pinkerton! When I was younger, I loved how ridiculous The Penguin’s real name sounded in Tim Burton’s Batman Returns: Oswald Cobblepot. Syllabically, this sounded similar! And given that Dill’s supposed to be short and rotund like Danny DeVito in that role, that fit, too! Dill sort of waddles when he walks because of the awkwardness of being a mutant. Everything else after that just naturally fit into place. I wasn’t even more than half a dozen chapters into The City of Smoke & Mirrors before I had thought of at least half a dozen other adventures that Dill could have: The Highway God, Mucho Murder, The Eden Singularity, Ghost of a Chance, Mutant Hollywood. So many scenarios couldn’t wait to written! Dill naturally fits himself into so many ridiculous stories. And best of all, they’re all relatively self-contained adventures, so I don’t have to stress out (too much) about world-building. I fell in love with Dill pretty much from Day 1. I hope you have, too, and will join along for the ride. This entry was posted in Dilbert Pinkerton, Joys of Writing, Writing and tagged Dilbert Pinkerton, writing. Bookmark the permalink.